It offers a lot of essential tools that are extremely useful in finding, structuring, organizing and reusing your contents. It comes with a user-friendly web interface which allows you to easily manage contents. It offers numerous options in administering new user accounts. It promotes effective collaboration by creating applications and sites that allow users to easily connect with each other and express opinions. It allows you to establish both external and internal facing websites without the need for a more customized programming. It comes with a reliable presentation layer which is effective in creating highly usable and more interactive experiences. If you are planning to become a certified Drupal expert, then it is advisable for you to enroll in a Drupal certification program which is now offered by Brainmeasures. You can expect the Drupal course to cover all the information that you need to gather about Drupal, how it works and the many advantages that you can get from using it. With the help of this online certification course, you are giving yourself the chance to undergo a well-detailed Drupal training which is sure to strengthen your skills and expertise in the field and help you in making the most out of the framework. You will get to know more about all the features installed in Drupal, the individual benefits of all these features and the most effective tools that you can use in effectively organizing and designing the contents of your established sites. The comprehensiveness of the Drupal certification course offered by Brainmeasures can transform you into a real expert in the field as soon as your certificate is already provided. 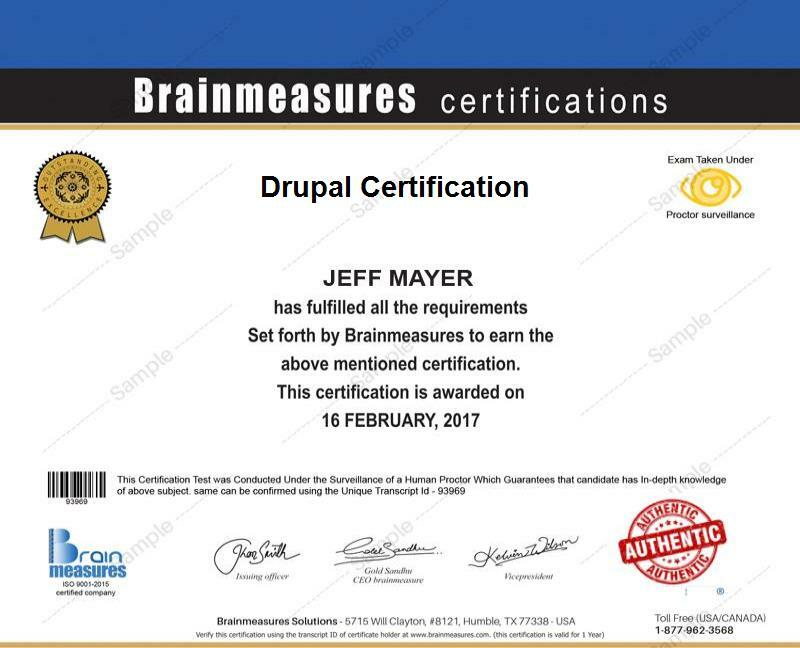 The Drupal certification program which is now available at Brainmeasures can be expected to offer numerous benefits to different individuals and professionals. You can expect this to work even more perfectly for local web developers, web designers, web content authors, project managers, back and front end developers who want to start performing their functions more efficiently with the help of Drupal. You can also expect this to work for web professionals, business owners of firms that offer services related to Drupal, technology decision makers and anyone who works in a business organization which already adopts Drupal. Earning a Drupal certification is also a major help in significantly boosting your financial stability considering the fact that certified Drupal experts can be expected to earn a higher amount of salary. If you decide to take advantage of your Drupal certification by working as a Drupal developer, then expect to start earning around $76,000 to $99,000 annually. You may also use your online certification to work as a Drupal consultant which gives you the chance to receive an annual salary within the range of $103,000 to $116,000. If you decide to work as a Drupal architect, then your expected annual salary would be around $114,000 to $125,000.